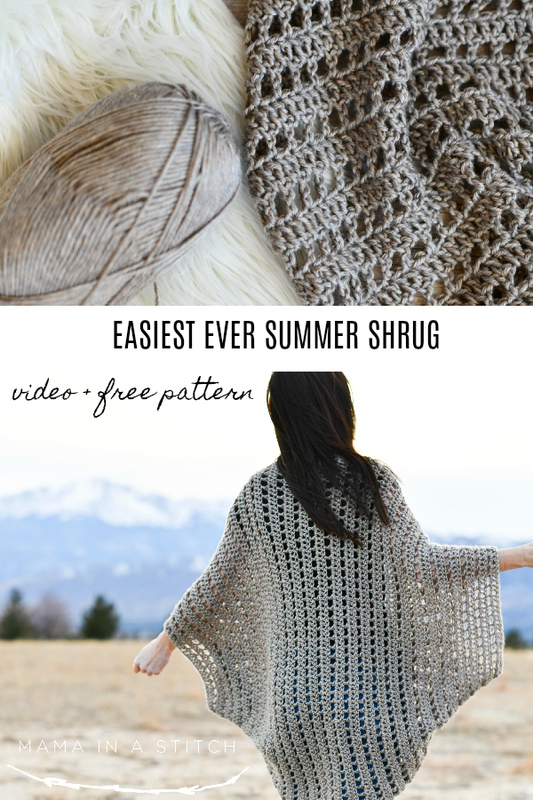 How about a new, pretty, beginner friendly crochet project that you can wear all summer long? 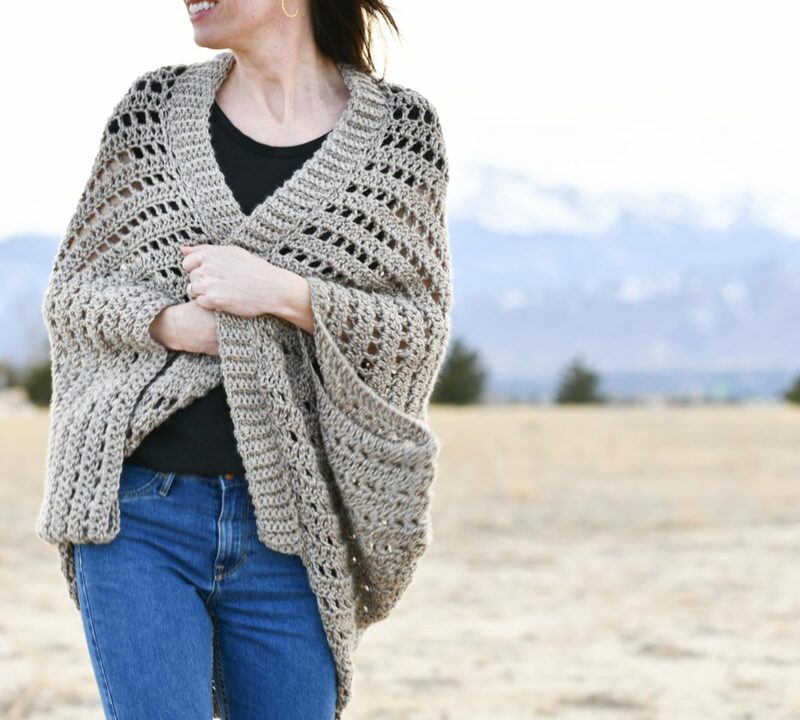 If you’re new to crochet, this is a fun project to stretch beyond single crochet stitches and make something beautiful that you can show off. 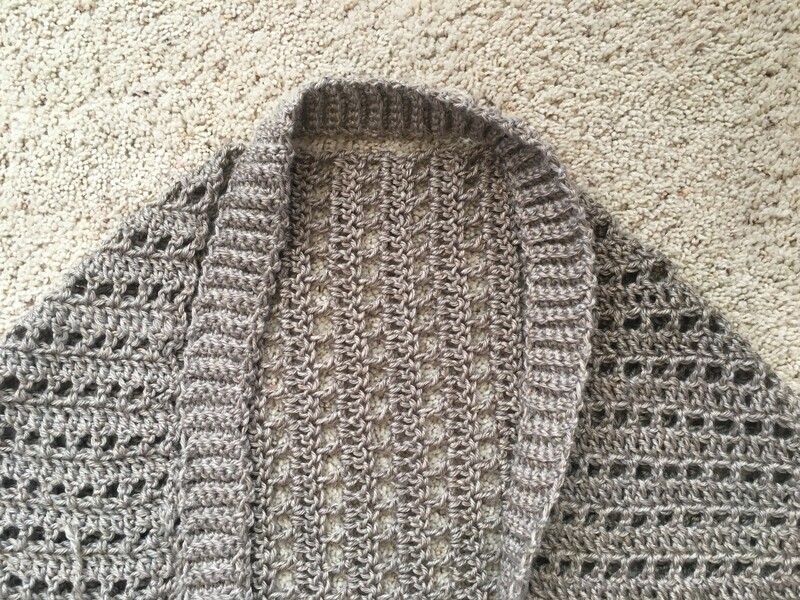 This might be my fave of all the summer blanket sweaters, shrugs and cocoons that I’ve shared over the last few years. 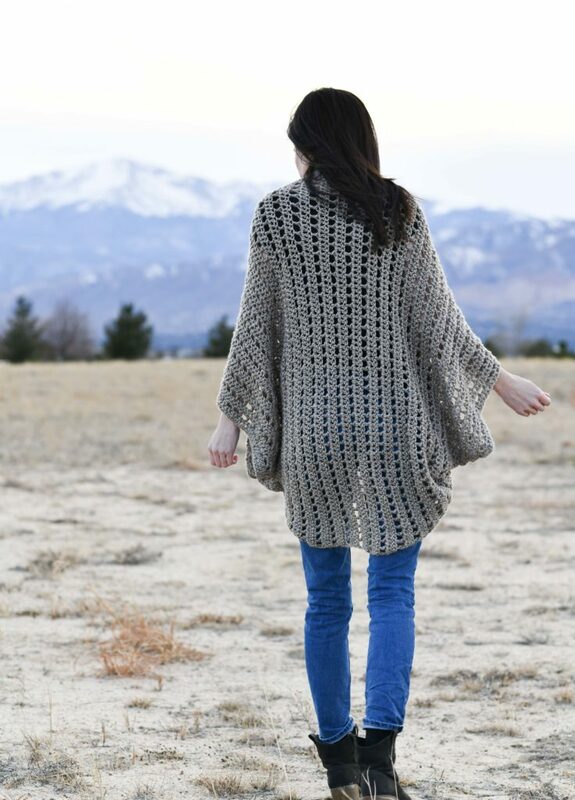 It was inspired by my Casablanca Poncho Pattern and the Mod Mesh Blanket Sweater both of which were simple projects made with Heartland yarn from Lion Brand (here). 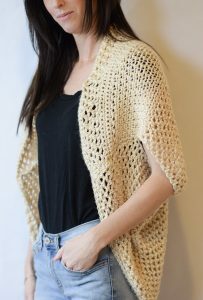 This “Easy Summer Fun Shrug” crochet pattern uses basic double crochet stitches and chain stitches to make create the open-work fabric and all you will need to do is make a big rectangle. You’ll find helpful photos below as well as a YouTube video to help you along! Back when I was just learning to crochet, I was always on the search for simple pattern ideas that were still pretty. I didn’t want to only make scarves and I know many of you might want to branch out too. And, neutral color lovers, rejoice! Isn’t this Grand Canyon color amazing? 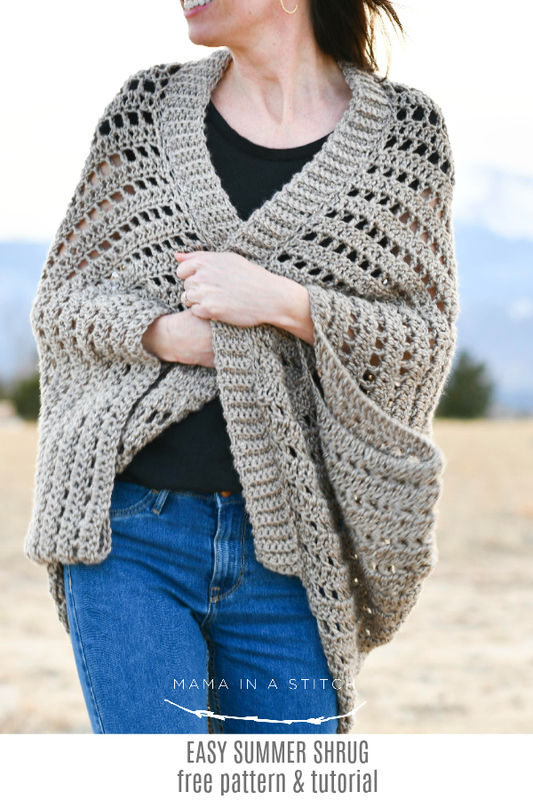 The yarn has incredible drape so it’s comfortable on the skin and the slight sheen makes it extra “summery”. I’m not always a fan of sheeny yarn (is that a word? ), but it works wonderfully in this case. And while I used just one color ( I know, I’m so predictable ), you can be creative and use as much color as you’d like! You can see all of the Heartland color options here. Go crazy! 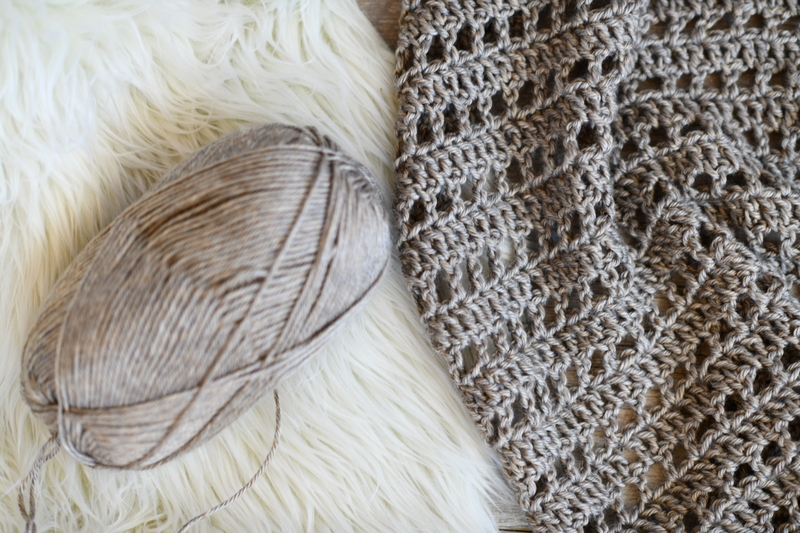 Below: This yarn is a budget friendly, incredibly soft option for summer knit and crochet projects. Today’s pattern is similar to these as it has the open stitch-work, but there’s no blocking needed and it’s just one piece (well, the collar’s attached separately but that’s it). So, shall we get to this pattern?! You’ll see the free pattern below and you can also find the ad-free printable version for sale in my Etsy shop here, which includes all the helpful photos and large print. 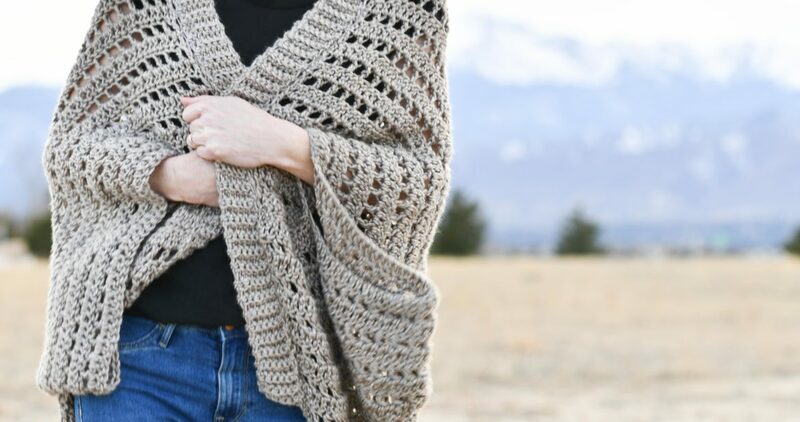 This super simple pattern uses double crochet and chain stitches to create a modern, open work fabric. The soft, light yarn is perfect for warm weather and the clean lines make it trendy yet classic. 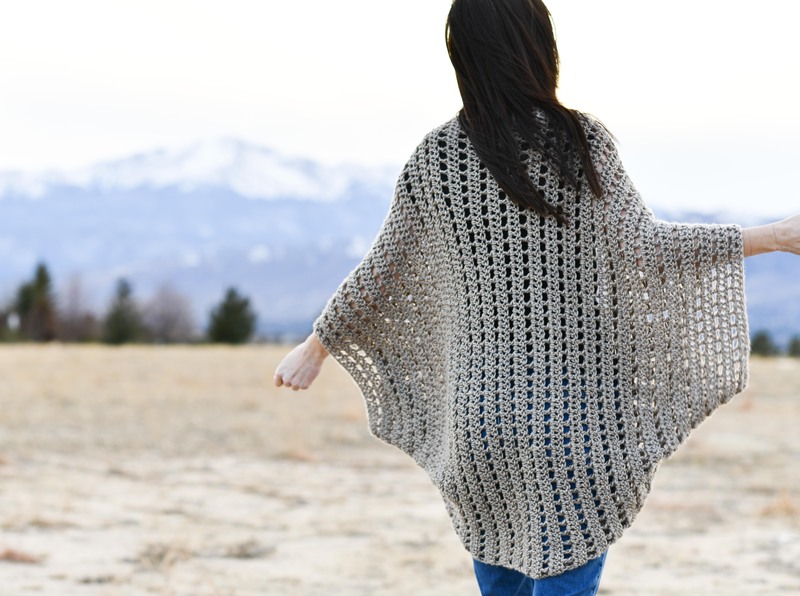 You’ll crochet a simple rectangular shape and fold to seam. The collar is attached at the end and lends to it’s comfort and style. This pattern includes pictures to help you along. Measurement is taken while piece is laid flat. 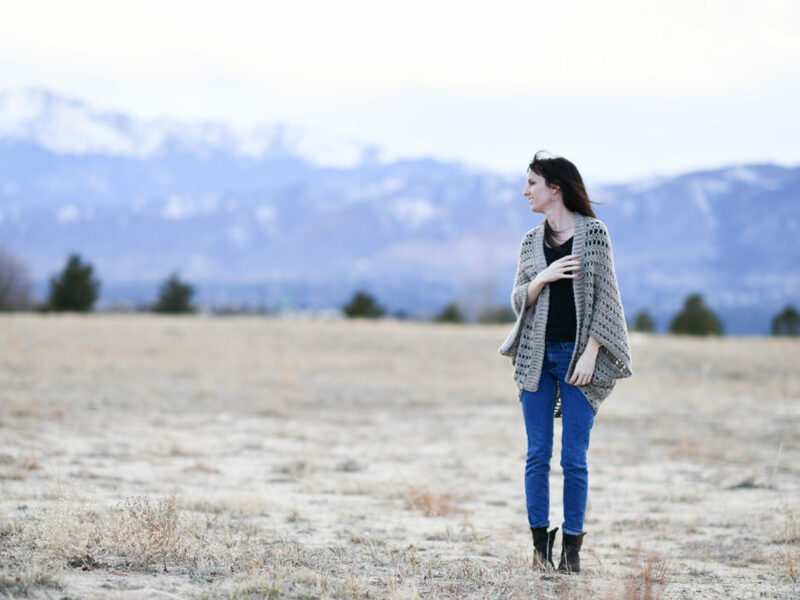 Notes: This shrug is created by crocheting a rectangle lengthwise while following the stitch pattern It is then folded and seamed to create the arm openings. 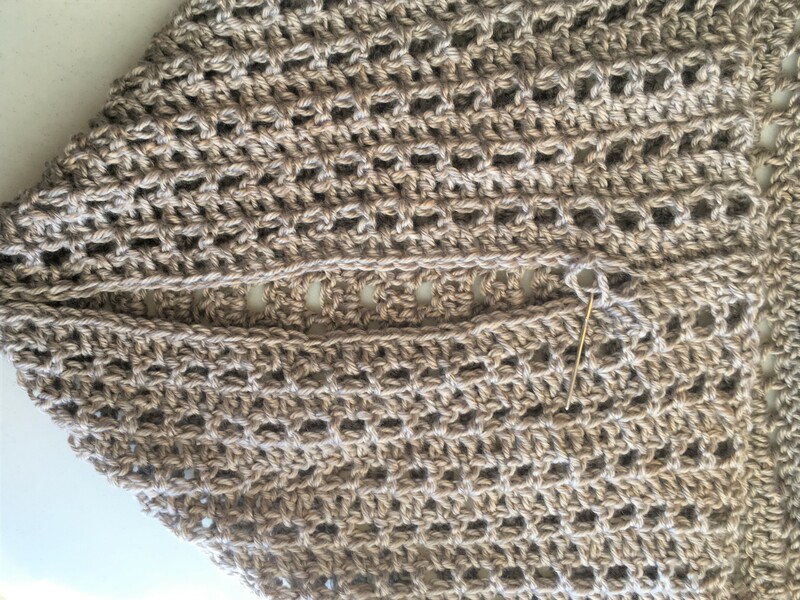 The collar is then crocheted separately at the end and is attached with a simple whip stitch. Repeat rows 2 & 3, in that order, until piece measures approximately 41” long. Tie off and weave in ends. Next, you’ll crochet the collar! Repeat row 2 until collar reaches approximately 60” long, tie off and weave in ends. Place rectangle width wise on flat surface. Fold each corner inward as pictured below. Seam the corners together, working approximately 4 ¾” inches inward leaving openings for the arms. Tie off and weave in ends. Center the collar onto your piece and whip stitch to attach. Tie off and weave in ends. Below: An up-close of the stitch pattern. 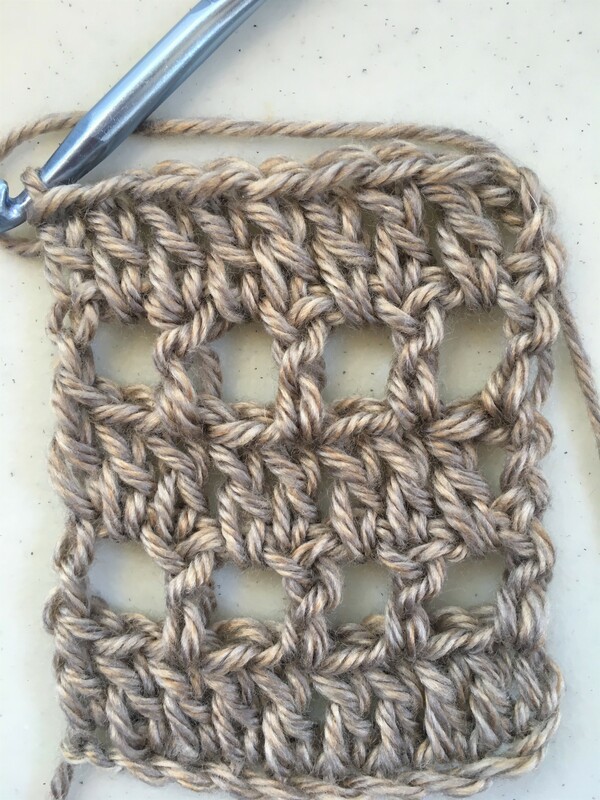 You may choose to practice the stitch pattern on a small swatch before beginning. Simply chain an odd number of stitches and follow the pattern for the Main Body of the shrug. Below: The completed rectangle. Your beginning chain is along the side of the piece as you are worked lengthwise. Fold the corners in as pictured. Below: The corners are all folded and now you will seam while leaving openings for the arms. Below: Seaming to create the sleeves. Below: Attach the collar and whip stitch to the shrug. And that’s all there is to it, my friends! I hope you enjoy it and I’d love to see if you make one! You can tag me on Instagram @mamainastitch and #mamainastitch to show me your finished pieces. Happy spring my friends. This pattern looks gorgeous and I was just looking for a pattern like this to wear over a summer dress if the air turns cool. Do you think it would be ok to substitute Lion Brand Comfy Cotton yarn for the Heartland? Yes!! I think that would be beautiful and I love the comfy cotton. I love the looks of this! Do you possibly have a knitted version! Thanks so much! I don’t have a knit version currently. Sorry about that! So happy you like it though! I’m so excited to try this. I even love that color! I’ve never whipstitched but I will figure that out…this would make a beautiful gift too! Thank you! Thank you so much for such a beautiful pattern. I am going to attempt to crochet this pattern. I know basic crochet but I’m better at knitting. Again thank you. I am so excited to begin on this. I hope I can figure out how to order pattern instructions and to purchase this yarn. Great find ! ! Thank you for the beautiful summer pattern. I’m new to making clothing. Can’t wait to wear it, but first I need to make it. I love all your shrug patterns! I’ve decided to make the Mod Mesh Blanket Shrug. It’ll be easy to transport with me in my new Caribe Tote, when not on me. Exactly what I need. 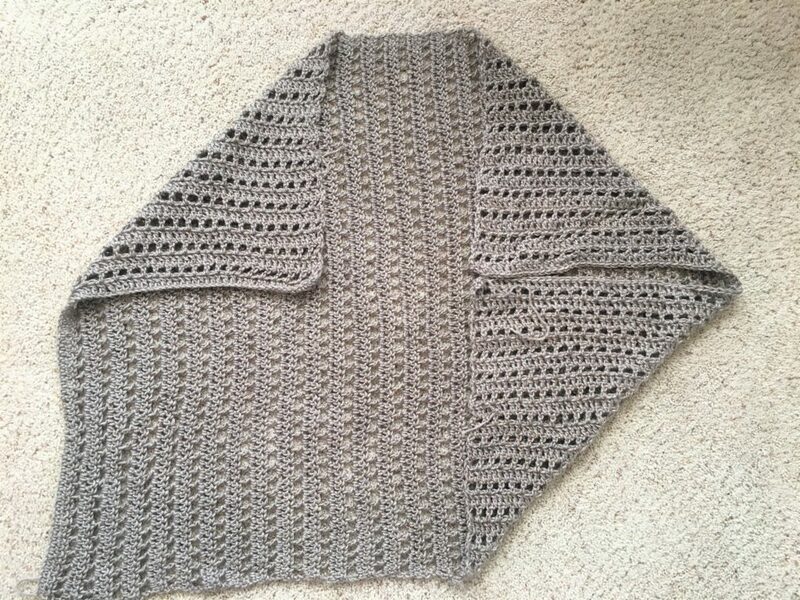 Jessica, thank you for another great crochet pattern. 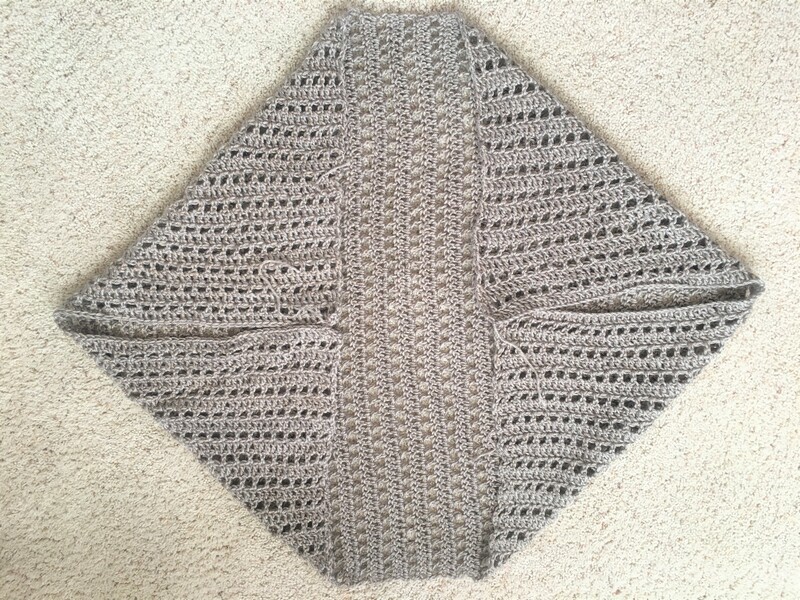 Do you know what sizes this shrug will fit? I have the yarn, I can’t wait to get started! Hi Jessica. I love all of your designs. I make each one as you release the patterns. I would like to ask if you think the Lion Brand 24/7 cotton and bamboo yarn would work for this project? I live in Texas and find the acrylic yarn too hot. Thank you.